A's inherent level of aggressiveness. A's reponsiveness to B's reputation. Those factors combine in a simple way to give a probability that A will choose to strike. Then, with one call to Math.Random(), the decision is made. This little graph shows the process. 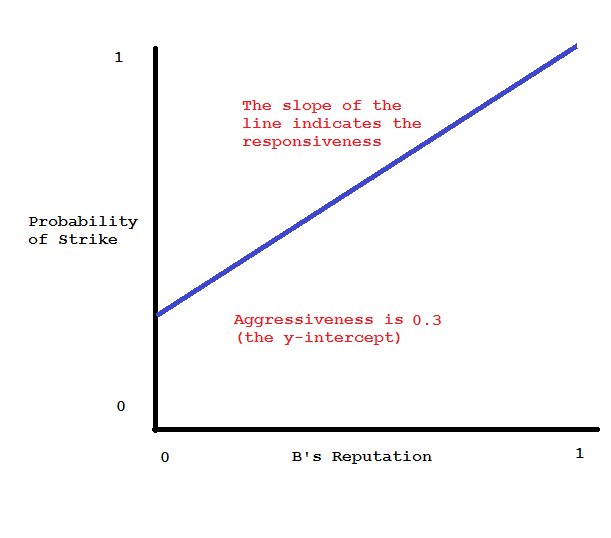 A negative responsiveness, meaning that the worse B's reputation, the less likely it is that A will strike him, corresponds to a downward slope of the line. While A is striking or healing B, B is also striking or healing A. A sim stars with 0 health points. He gains points when he is healed, and loses them when he is struck. When he gets healthy enough, he reproduces. When his health is too far in negative territory, he dies. Initially, we populate our world with 10,000 sims, with aggressiveness and responsiveness factors evenly distributed. Then, we randomly pair them off, let them do their thing, When that round is done, we pair them off again, and so on, until we decide to end the game. If you press Play in the game below, you'll see some blue discs. The location of each disc represents aggressiveness and responsiveness. The area of each disc corresponds to the number of sims with those characteristics. You can also vary the parameters. After much tinkering, I've found a set of parameters that tends to produce two different outcomes, depending on how the random aspects of the game play out. (Try it several times and you'll see.) I've made those parameters the defaults. Enjoy! Of course, the game below is hosted by Plunker, so you can inspect and edit the code to your heart's content. 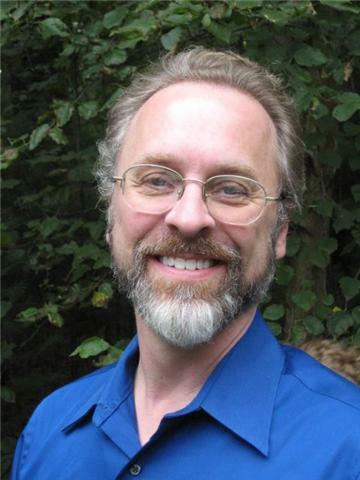 You'll be playing in your own sandbox; there's no danger of wrecking anything.